Jim Runham is a man of exceptional courage, community spirit and service, as well as devotion to his family. This is evidenced by his award of the Star of Courage, Australian Fire Service Medal, Order of Australia, numerous community and sporting awards, as well as his life story. Jim's exceptional courage, resulting in his award of the Star of Courage, was demonstrated on 9th November, 1993, when he witnessed a bank robbery, pursued the robber and assisted police to apprehend the robber. Jim was outside of the First Provisional Building society in Ipswich with his son when he saw a man point a revolver at a teller, demand money and leave the premises. He sent his son to get help and began to follow the robber. He followed him into an alley when the man realised he was being followed, took out his revolver, advanced on and fired at Jim at close range, missing him and hitting a metal pole. A ricochet hit Jim in the knee. The robber ran, and despite his circumstances, Jim continued his pursuit. The robber again fired at Jim who then took cover. The robber then approached Jim, at close range aimed at Jim's head, but then fled, possibly because of witnesses around. When the police arrived, Jim was able to give a detailed description and the robber was apprehended. Even with personal threats and threats to his family, Jim testified at the robber's trial. 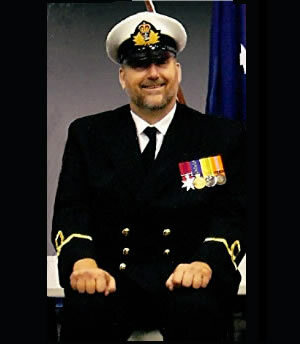 The personal trauma associated with the incident led Jim to seek help from others with their own bravery stories, and ultimately the formation of, and service to, the Australian Bravery Association. Jim has, and continues to be, committed to numerous worthy community and sporting organisations. He was awarded the Australian Fire Services Medal for services to the Queensland Rural Fire Services as a member of his local brigade as well as holding executive roles within the organisation. Jim and his wife Jan, as a result of their desire to improve opportunities for their disabled son and others in the same circumstances, devoted considerable energies towards services for the disabled. 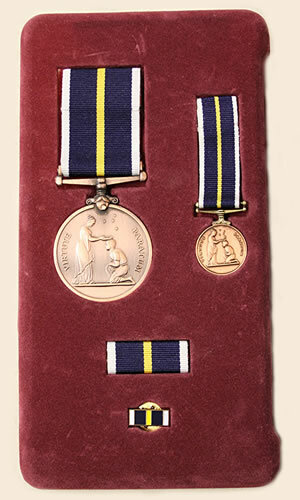 This was acknowledged by Jim's Order Of Australia Medal 'for services to people with disabilities'. 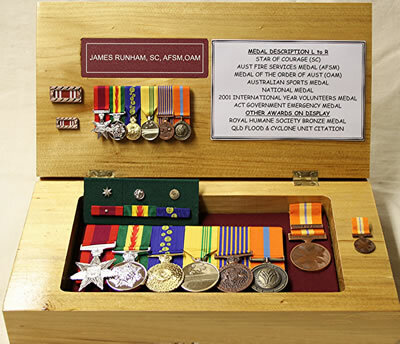 Jim has also been awarded the National Medal for service to the Nation, the Australian Sports Medal for active involvement in numerous sports, the International Year of the Volunteer Medal 2001 and the ACT Emergency Medal 2003 Clasp. Jim was also awarded the Royal Humane Society of Australasia Bronze Medal for brave acts during the 2010-2011 floods and also a Group Citation for bravery. He was also part of the TS Ipswich (Naval Cadet Unit) that received the Queensland Flood and Cyclone Unit Citation 2010-2011. Jim also has numerous certificates, awards and memberships to demonstrate his outstanding community spirit. Jim is a devoted family man. 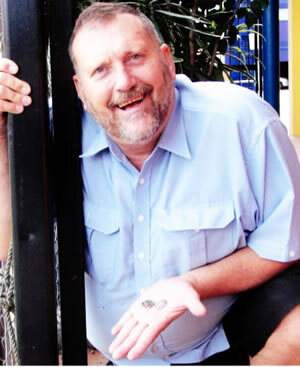 He has been actively involved with all his children's education and personal development. This included involvement in their P & C, joint memberships in community organisations, individualised joint activities and setting of a fine personal example. Jim's personal story is one of individual commitment and sacrifice and is an inspiration.